I also love to put into my catalogue mailings little gifts, be it a card, or something like this! If you have received your catalogue this week, what did you get? 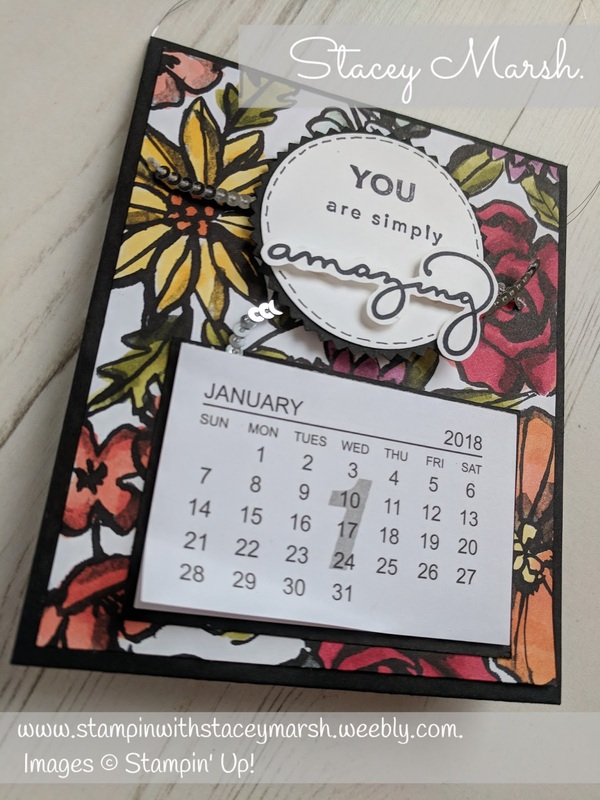 These calendars really are so simple to make and took me hardly any time at all to put together. You can even get 2 out of an A4 sheet! The base is made from Basic Black Cardstock measuring 4, 1/8" x 11, 1/2". With the card base placed lengthways in your scorer, score at 5", 5, 1/2", 6" and 11". Fold around and secure with the left-over tab at the end. I have used some of the new Petal Passion Designer Series Paper which is actually just a black and white monochrome DSP, but I have added colour with the new Stampin' Blends to lift it off the page. (I'm actually quite impressed with my colouring too!). 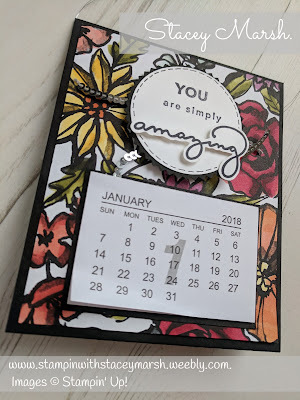 The stamp is from a new Sale-a-Bration freebie set called "Amazing You" and I have punched it out with a 2" circle punch and the Starburst Punch to lift it off the DSP. All the products are available now, and remember with Sale-a-Bration you can earn stamp sets, DSP, embellishments and Dies all for FREE! !